Sir John Martin-Harvey, The Only Way, and a Precious Piece of Fabric – is there room for me to sew? As a quilter I keep a lot of fabric at home but the most precious piece of fabric in my possession is part of an old theatrical costume from over a century ago. It is very fragile so I hardly ever get it out to look at, let alone touch – I worry about its further disintegration. 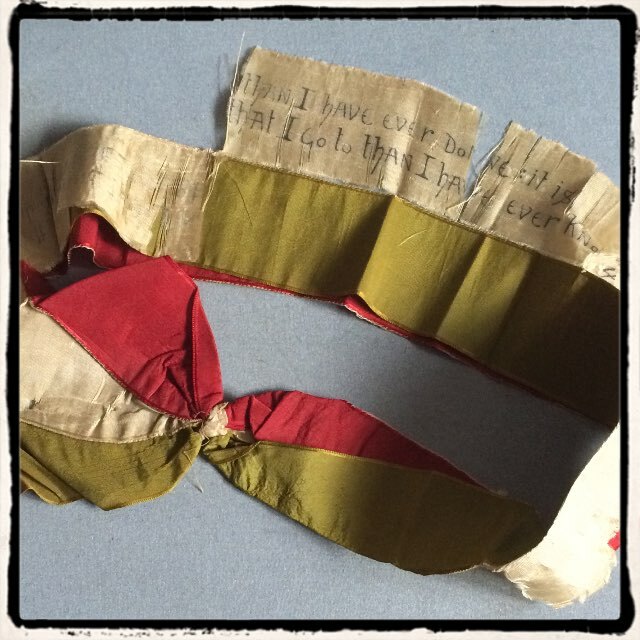 It is a silk sash on which someone has written the famous words spoken by Sydney Carton before he meets his death on the Guillotine at the climax of Charles Dickens’ A Tale of Two Cities. The sash belonged to an actor, Sir John Martin-Harvey (22 June 1863 – 15 May 1944), who made his name playing Sydney Carton in a play called The Only Way, based on Dickens’ novel. It is thanks to the perilous state of the sash that the quote from Dickens can be seen; it was hidden, written into the lining – presumably by Martin-Harvey himself – but over the last hundred years the fabric has come adrift somewhat and so the secret wording can now be seen. Of course I never saw Martin-Harvey on stage but luckily for film and theatrical historians, there is a lasting record of his most famous role. The Only Way was filmed in 1926, directed by Herbert Wilcox. Thanks to its survival we can still see the star performance of Martin-Harvey as the dissolute but ultimately heroic Sydney Carton in this silent film version. I remember vividly the first time I saw the film. I was in Cambridge in the Spring of 2012 and it was playing as part of the British Silent Film Festival. The Only Way was on my must-see list; I love Dickens and A Tale of Two Cities is probably my favourite of his novels. 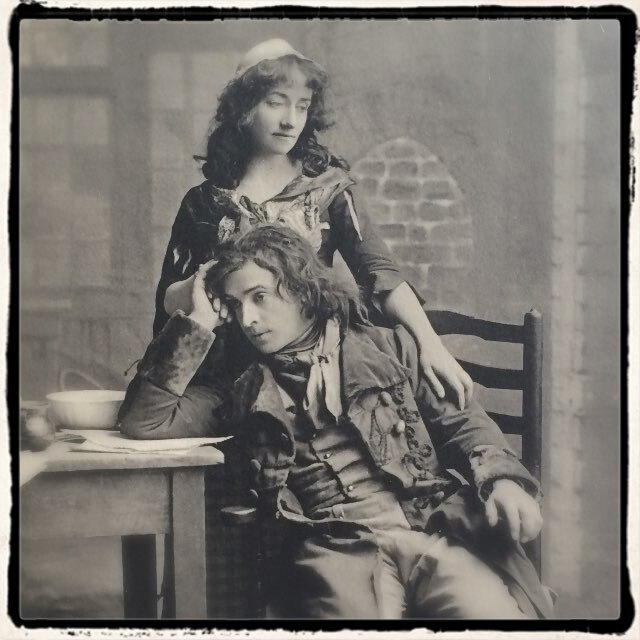 I knew nothing of Martin-Harvey and nothing about the film but context was provided by the musician Neil Brand who, in introducing it, said it was a rare opportunity to see one of the great Edwardian Actor-Managers at work. Neil said that, at some screenings, as the film drew to a close, the projector would be turned off and Martin-Harvey himself would appear and recite the famous final lines – an experience loved by audiences. To begin with, I was underwhelmed. 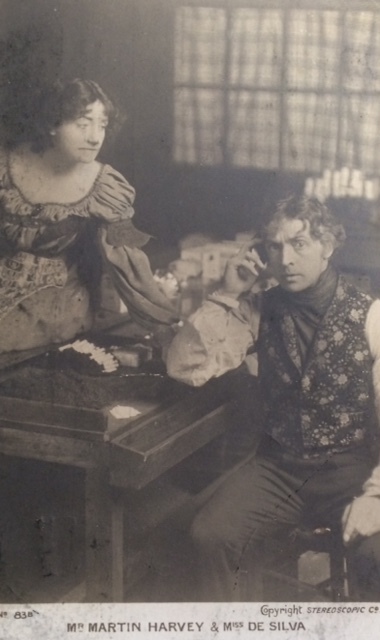 The film began with a long, slow prologue about the Evremonde family, and, when Martin-Harvey appeared on the screen, my immediate response was “He is far too old to play Sydney Carton.” By the time the film was made, Martin-Harvey was 63 and had been playing the role of Carton on stage for 27 years. I started to anticipate grand theatrical gestures and wondered if I could slip out without disturbing too many people. And then something happened – one of those transient moments that transform a performance entirely. For you and any dear to you, I would do anything. The scene is Dr Manette’s house in London. Carton comes visiting. He loves Lucie Manette but knows he cannot expect her to return his love. Instead, he tells her that he would do anything for her and for anyone she loves. And during this scene, Martin-Harvey picks up some rose petals that are lying on the table and runs them through his fingers. And that was that. That small movement transformed him. He was Sydney Carton. His tour de force at the Tribunal. The devotion of his servant, Mimi, that he fails to notice. The brilliant final scenes in the Bastille alongside other prisoners waiting for death. His inspiring courage in Mimi. And, of course, the last words: “It is a far, far better thing.” I was completely transfixed. Since that screening, I have amassed quite a collection of Martin-Harvey items. Some of my favourites are postcards – not so much because of the pictures they feature, but because of what is written on the back. 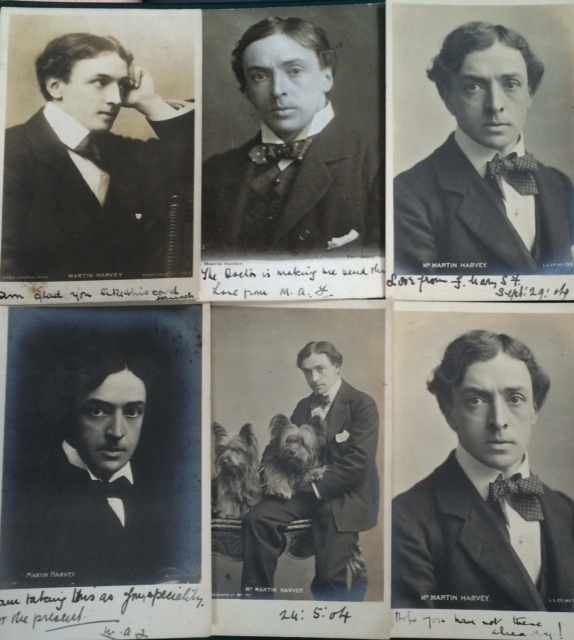 It is very clear that Martin-Harvey had a very loyal following; some fans would make a note of each theatrical performance they went to (often multiple times to The Only Way) or write down their favourite lines. He was brought before the curtain 5 times and then had to speak. 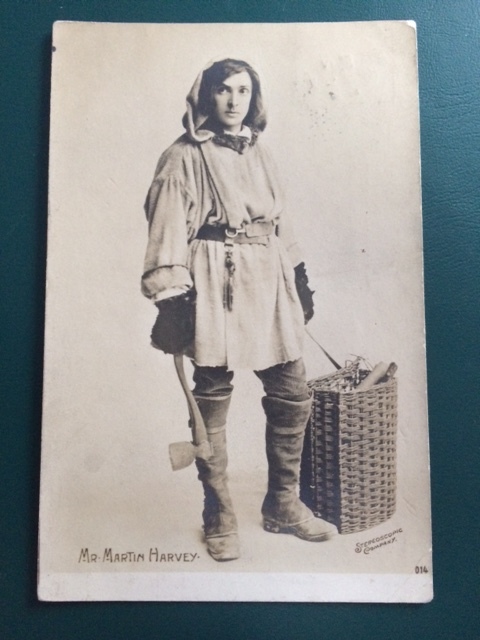 Others seem to have been taking part in organised postcard swaps, like a Miss O’Rourke from Nottingham, who received lots of pictures of Martin-Harvey in 1904. One, however, seems to have been from a friend with a sense of humour and a cryptic message: The Doctor is making me send this. I am afraid of sending you cards of Martin Harvey that you may have already, wrote B.P. 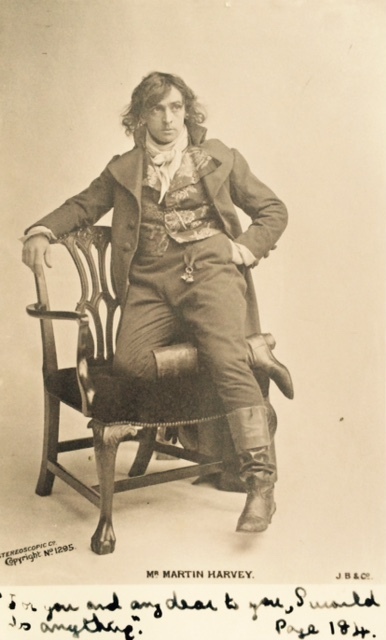 to Miss O’Rourke in November 1904 on a postcard showing the actor in The Breed of the Treshams. Is there anyone else? From the evidence of the cards in my collection, it would seem not. A Miss Dobbings is asked by an anonymous friend How do you like “His Serene Highness” in this garb? How do you like “His Serene Highness” in this garb? A.C.H. 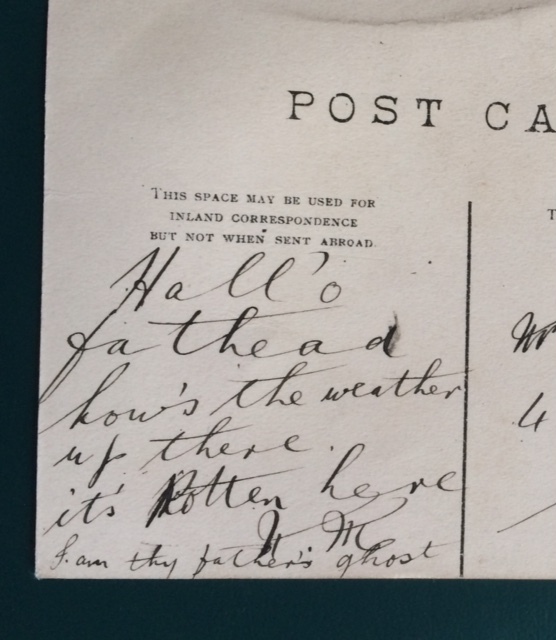 saw a postcard as I came home and thought perhaps you would like it, and sent it to her friend Enid Downs in Hull, while Maggie Harwall was sent Another one for your collection by her friend Nellie. In 1910, Eva Henderson was asked by her friend Anna How do you like the gentleman on the other side? Miss Smith of West Dulwich has clearly been quite specific about the card she wanted, as her correspondent Georgie writes I do hope that this is the postcard you wanted. They had several of him but this is the only one I could see where he was sitting down. And apart from the devoted fans, there are those intent on teasing their friends. 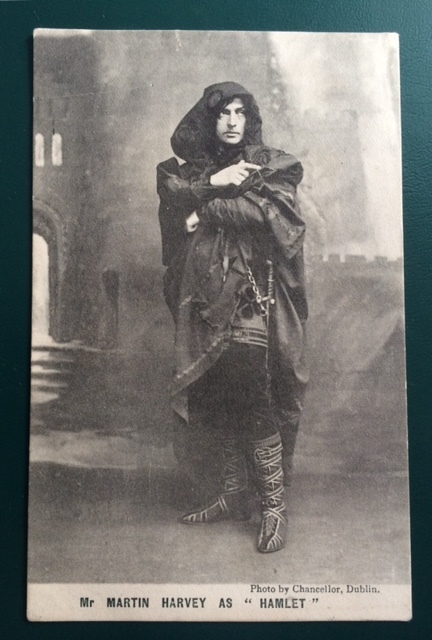 In 1907 Mr Jack Thompson received a card featuring Hamlet with the immortal words Hallo fathead. How’s the weather up there? It’s rotten here. I am thy father’s ghost. I am intrigued by these postcards. Who were the people who sent them? Who collected them? So many clues can be found on these items and it opens up a world of theatrical devotion from more than a century ago. You can still watch The Only Way at the BFI Mediatheque. Unfortunately, the viewing copy has no music and is completely silent – not the way it was intended to be shown – but it is there nevertheless. My advice is to just go with it. It starts slowly. But there is a moment when it gets under your skin. And from then on, it is wonderful. 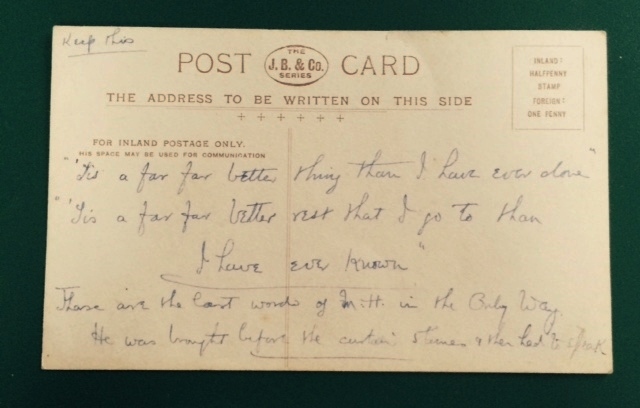 A really interesting blog and fascinating glimpse into past lives through those postcards. Thanks Alison. I love the comments on the postcards. Some collectors like only unused, pristine cards, but I actively seek out the ones that have been written on or posted – they hint at so much! 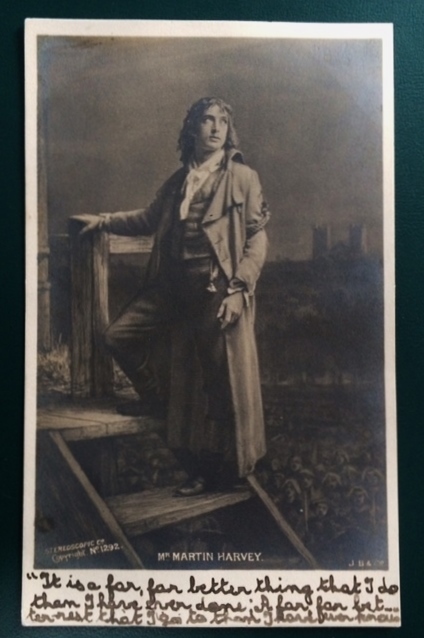 Pingback: John Martin-Harvey and Fan Letters to Hamlet | is there room for me to sew?